Nostalgic showing of Spielberg's "E.T. 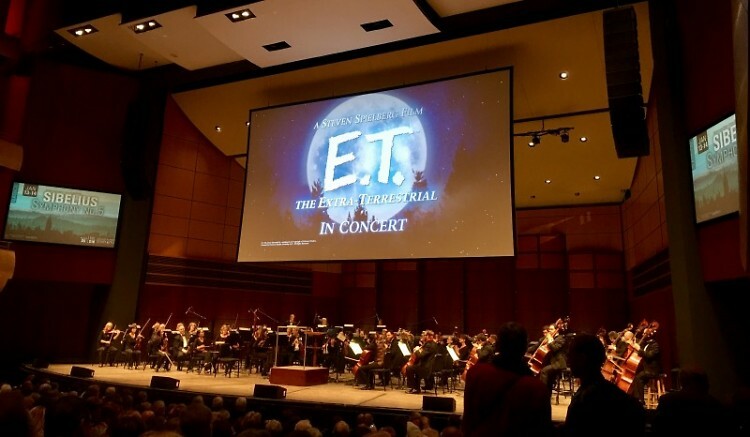 The Extra-Terrestrial" and live performance of score by the Grand Rapids Symphony creates powerful atmosphere of community. To view upcoming performances and purchase tickets to the Grand Rapids Symphony, visit grsymphony.org. The Grand Rapids Symphony’s performance of John Williams’ score for "E.T. The Extra-Terrestrial" brought a sweet sense of nostalgia and close-knit community into Grand Rapids this weekend. Among those moved by the performance were first-time guests Logan Carey, Symphony volunteer Sue Hartman and Symphony musician Paul Austin. One sat in the auditorium, one worked an information table and one played onstage, but they were all connected by the concert and film’s beauty. “I know the story, and I knew they’d enjoy it!” said Lois Carey about sharing "E.T." with her young granddaughter and friend. Many in Grand Rapids felt the same this weekend about Steven Spielberg’s classic 1982 film, which was shown in its entirety during this performance. The musical score for "E.T." is familiar to many and won an Academy Award for Best Original Score. Led by Associate Conductor John Varineau, the Symphony artfully met the challenge of performing music at the mercy of an unstoppable and sometimes varying metronome, the film itself. Concertgoers laughed, gasped and wiped wet eyes together at the moving story of ten-year-old Elliot and his unlikely alien friend. Ten-year-old Carey came to the show with her friend Sophie Stob, grandmother Lois Carey, and family friend Jean Moldal. She was excited to watch "E.T." for the first time, and as a young pianist and flutist herself, she could not wait to hear the Symphony perform. Her grandmother had only praise for the Symphony, which she has been attending for nearly 30 years and had been eager to introduce to her granddaughter. “You just feel like you’re in a big community. We’re so proud of our symphony. We are, truly,” Lois Carey said. That pride was echoed by many in the audience last night, as concertgoers expressed what a privilege it was to have such a talented symphony right here in their hometown. There were many first-time attenders in the audience as well, perhaps lured out by sweet memories of their first experience watching "E.T." Nearby at an information table, Sue Hartman was sharing her infectious love for the Symphony and this weekend’s performance. “What brings you to the symphony tonight?” Hartman asked the families walking past. She is a faithful volunteer with the Grand Rapids Symphony and delights in meeting new people at the performances, especially those visiting for the first time. “Have you come to any of the other concerts? Are you musicians? Music lovers?” she continued questioning. She cheerfully recommended upcoming concerts and shared her own love of music with guests - classical style is her favorite - but she’s come to appreciate the other genres, too. “How many times am I going to hear these pieces of music in my life?” Hartman said, explaining her eagerness to see the same performance multiple times. Meanwhile, warming up backstage was French horn player Paul Austin, who has been a member of the Grand Rapids Symphony for 17 seasons. Austin has lived in the Grand Rapids area for 20 years and is proud of the way the Symphony brings it to life. “The GR Symphony is a cultural gem of the community,” Austin said. “And with the new music director Marcelo Lehninger it’s only going to improve.” Performing with the Symphony is Austin’s full time job, and he has had to work hard perfecting his instrument to get where he is today. Austin spoke of the way the Symphony unites the greater Grand Rapids community, and the audience’s enthusiastic response to "E.T." was a testament to that. “We really want to be a symphony that represents the community, something the entire community can be a part of, not just one element,” he said. From the audience to volunteers to the musicians, the sense of community was certainly evident for this performance. For more information on the Grand Rapids Symphony's upcoming performances, visit www.grsymphony.org.